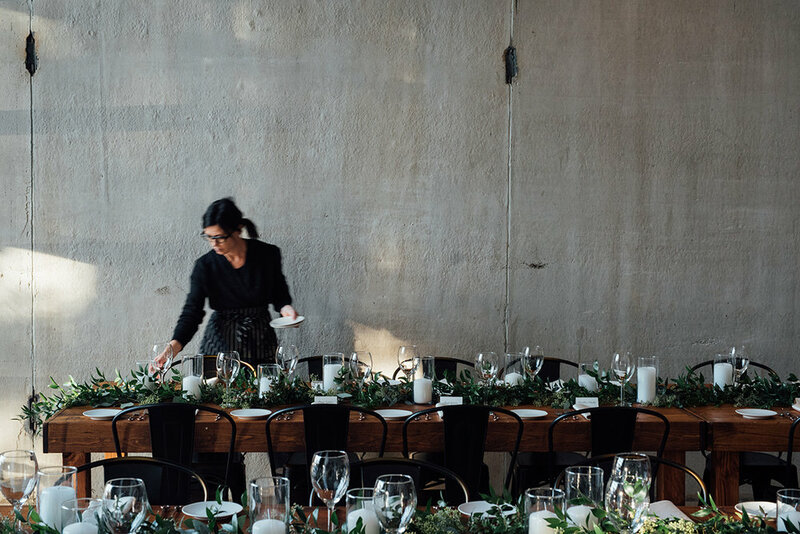 PLAN YOUR WEDDING GUIDE — BEEHIVE FLORAL CO.
A free guide from Beehive Floral Co.
Planning a wedding on your own can quickly become overwhelming. You want to find not only the very best vendors to work with but people who really understand the spirit of your wedding - and trust me when I say every single wedding is different. Since I've spent a good amount of time working weddings and editorial shoots alongside what I consider to be some of the best in the industry, here's a list of my favorites to help you determine who might suit you best. Katie Bushell of Havenwood Design Co. I meet a lot of brides who underestimate how overwhelmed they will be on their wedding day. My husband and I paid for our wedding out of our own pockets so our budget was modest but one thing I did splurge on was a Day of Coordinator. I'll never forget the moment I heard Kelly Martin of Right Hand Gal had sent my family home to their beds and cleaned up the entire wedding venue herself. It was so meaningful to have that kind of help because my family and friends had so lovingly and generously put their time into setting up and organizing our wedding day for us. You might not be aware that Wedding Planners and Stylists often have completely scalable packages. If you have any space in the budget, hire a Planner, Stylists or Day of Coordinator. Typically a planner will help you envision your dream wedding and execute all the details. They will help with everything from dress selection, to booking your venue to hiring your florist, photographer, DJ and etc. to managing the entire day from beginning to end so all you and your family have to do is arrive as guests. A Stylist helps you jump off your Pinterest board obsessions into the wedding day that best suits you and your style, helping you select the right venue, providing rentals and decor and helping you select the best florist. A Day-of-Coordinator oversees just the day, making sure your family and friends are comfortable and that your vendors arrive on time and deliver services as promised. Many venues will include this service so be sure to ask about this on the day you book. Whether you choose a full wedding planner, a stylist, or a day of coordinator, it is well worth the investment when you are planning an event of this importance and scale. They will think of things you hadn't, they will make sure your vendors get all the communication and coordinating they need and they will make sure your family, your wedding party and your guests are comfortable so you can relax on such an important day. Tablescape by The Blended Table and Beehive Floral Co. There are so many food and drink options these days from the ever popular Donut Walls and Desert Buffets to Food Trucks to Buffet Style Dinners to full formal sit down extravaganzas. The right caterer will not only treat you to a smorgasbord of culinary delights to match the ambience of your wedding from casual party style to full formal candlelit dinner but will also ensure your place settings are just so, the food looks delicious and the guests are well cared for. Look for a company that comes highly recommended and be sure to ask if they will not only be serving but bussing your tables (a detail that is sometimes overlooked in initial contracts)! Photo Credit The Blended Table and Tess Comrie. Beautiful minimal cake by Annie Bee Cakery. There's no question for me that aside from floral design, the wedding industry that's undergone the biggest stylistic shifts this past year is in cakes. From naked cakes to several tier cakes with flowers pressed in sheets of crystallized sugar to waffle cakes, there's no end to the possibilities and something for even the most stylistically inclined. Here's a list of some of the best in the industry here in Salt Lake City, most with vegan options. Photo Credit: Annie Bee Cakery. Photo by Haley Nord with a touch of floral by Beehive Floral co. It seems kind of like everyone is a photographer these days. But I can tell you there is a huge difference between just a photographer and the photographer of your dreams. The best wedding photographer has not only spent a good amount of time honing their craft, but really understands how to get to the heart of the humans they are portraying. I will never forget the time I got photos back from a branding session with Haley Nord. She'd tricked my nervous self into letting her take portraits of me. Not my favorite. I literally teared up as I looked at what were the probably some of the first real portraits of me that truly seemed to represent my spirit and not just how someone else sees me. My best advice for choosing a photographer is first, look at their portfolio to make sure their style matches your own. Do you like dark and moody? Or are you looking for brightly lit with sharp clean lines? Then go straight to their portraits. Do the couples look awkwardly posed or like they are trying to be someone they're not? Do all the photos look the same? Or does each photo seem to get to the unique heart of the couple, the family and the day? I've been so honored to work with so many incredibly talented photographers and videographers over the past little while. Here is a list of my very favorites that I would recommend you book, right now, before they are gone! When it comes to a wedding, setting is everything. Start by writing a little bit about you and your partner. How did you meet? Where did the engagement happen? What's really important and special to you both? Is a remote wilderness elopement with stunning mountain and forest backdrop you? Or are you more into the rustic farm setting with whiskey barrels and architecturally stunning barn? Would you be more at home inside the grandeur of an industrial minimalist interior strewn with just the right vintage rentals like a deep red velvet couch and towering houseplants? Or are you looking for the rebellious edginess of a Brewery or Coffee House? One of my favorite aspects of my job is that quiet time before guests arrive when I can really breathe in a space and come to appreciate what gives it that unique character. Here's a little list of my favorite locations complete with wedding coordinator contact information.